Three years ago today we got the best Christmas present EVER...we found out that Eli would be joining our family!! It's a funny story really, one I've never blogged about. So without further adieu, here is how it all went down. It was a Tuesday morning, and I woke up "bright and early" at 8:00. Before we continue with this saga, I need to interject that it makes me laugh to think that I USED to consider 8:00 early! I mean, I now start my day FOUR HOURS sooner! 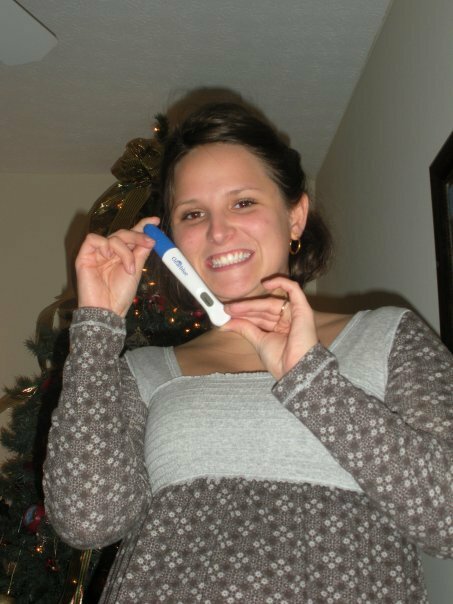 I woke up "bright and early" at 8:00 that Tuesday having had a very vivid dream that I was pregnant. In this dream my mom and grandmother were talking with me about childbirth and calculating that I was due around labor day. Still a little groggy from my morning brain, I did a little math and determined, "that's weird, if I really was pregnant that would be about right." STOP. THE. WORLD!! The possibility hit me like a ton bricks. No, that was impossible. I mean, we were newlyweds...two months in. This couldn't happen so soon. Plus I couldn't have kids, right? And my period....oh crap, what period? When was my last period? As I endured a minor panic attack, I racked my brain for pregnancy signs I could have missed. The weekend prior I had poured myself a glass of wine while wrapping presents. It tasted TERRIBLE which I chalked up to a bad bottle. Could it have been my body rejecting alcohol? No...it was bad wine...right? Ok, forget Friday what about Saturday? Let's see. Saturday we looked at a house, loved it, had a weird feeling about it and decided to wait before buying. Oh goodness, was our subconsciousness telling us not to buy because we were pregnant? Moving on. Saturday afternoon we met some friends at a basketball game . Oh crap, I drank two bottles of tomato juice while eating dill pickles. Cravings? Impossible...I just like tomatoes and pickles. What about Sunday? It was normal. I drank two more cans of tomato juice and that's it. Right? Oh wait. I was peeing every hour. Must be all that tomato juice. No, that's not possible. The sodium should be making me retain water, not pee. What is going on here?? 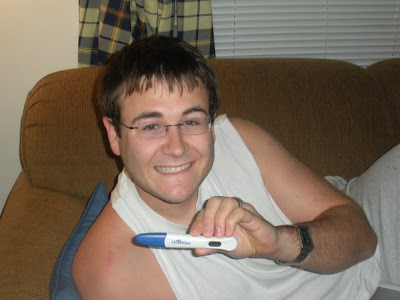 Needing answers, I jumped out of bed and ran down the street to Wal-Mart where I bought a pregnancy test. I'm sure the checkout lady thought I was a big ole skank with my greasy morning hair and my sweat pants. Oh wait, it's Wal-Mart. She probably sees that every day. 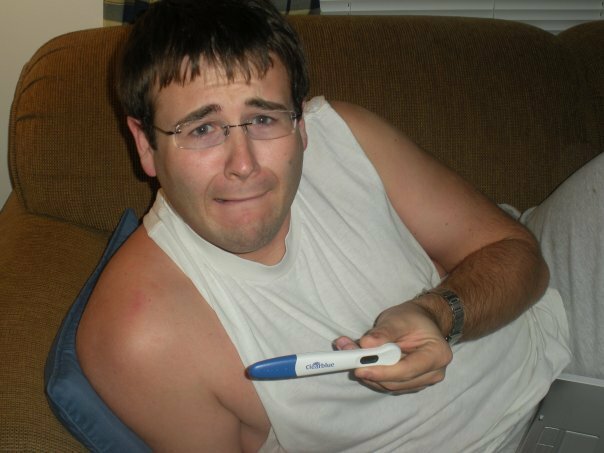 Back at home, I was still skeptical about the possibility of being prego. Nonetheless, I took the test immediately but left it on the bathroom counter while I busied around the house. A few hours later I came back and saw the (+) positive sign. I need to interject that I didn't know until this week that after sitting more than 10 minutes the test could give a false reading. Oops...still not the case! I sorta flipped out at this point and called Eric crying my eyes out. Here's how the conversation went. Me: (through snuffling and sobs) "Eric, I need you to come home." Eric: "What wrong, baby. Is everything ok? Eric: "I'm on my way." This is the point where Eric bolts out of his chair and beelines for the door telling his boss he'd be back. To which the boss asks, "What's wrong is Morgan pregnant or something?" Smart man. Do you think it was the deer in the headlights look that gave it away? 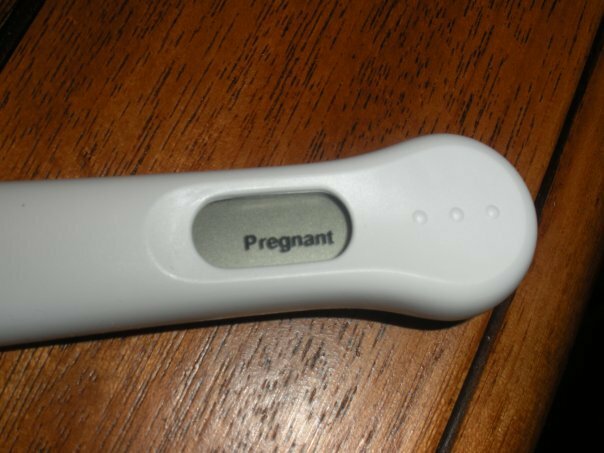 When Eric got home I just pointed to the coffee table where he saw the pee stick sitting there telling the story of our future. He just took me in his arms and kept telling me it would be ok.
We followed that little touch of sentiment with a classy lunch at Sonic and FOUR more pregnancy test. Two were digital, and two were cheapos from the Dollar Tree where the clerk took it upon herself to inform us that they weren't reliable....really? Too much information, LADY!! Once the shock wore off, we were thrilled about becoming parents. Of course, Eric reminds me often of my overreaction to the news...haha! Goodtimes!! This made me laugh so hard I almost cried!